I’m a big fan of hot drinks, especially in the winter. Teas of all sorts, flavored coffees, spiced cider, even just plain old warm water with some lemon squeezed in..heat it up and I’ll happily drink it. 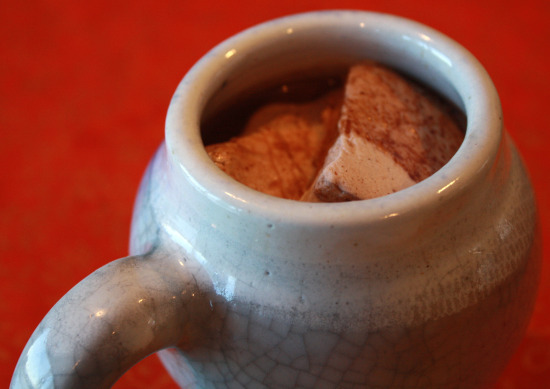 Here’s one of my absolute favorites, though…real hot chocolate (meaning there is no water or processed hot chocolate mix involved) with homemade marshmallows. I make my real hot chocolate with raw milk. That’s right- milk straight from the cow that I purchase from a local farm. If raw milk is unavailable to you or if you wouldn’t dream of drinking it, you can use organic milk. If you don’t do dairy, try this with homemade or store-bought almond milk (or hemp milk). Besides the milk, all you need for hot chocolate made from scratch is raw cacao powder (or organic/high quality cocoa powder), a little sweetener of your choice (can be organic sugar, honey, agave syrup, etc), and an optional pinch of salt and/or cinnamon…yum….. If you want your hot chocolate to be on the decadent side, you can whisk in some dark chocolate. In fact, you could skip the cocoa powder and just use more dark chocolate (about 3 oz. per serving) if you’re looking for something really rich; top it with real homemade whipped cream for an over the top hot chocolate experience. While the idea of regular marshmallows is gross to me, I feel differently about the once in a while consumption of homemade marshmallows. If you’ve never made them before, don’t be intimidated; I made this recipe from Not Lazy.Rustic. over the weekend…it’s easy and the marshmallows have a nice touch of cinnamon and cocoa…definitely a fun treat. I gave most of them away as gifts, but did save a few for hot chocolate purposes! 1. In a small pot on the stove, heat the milk until it is just short of boiling. Whisk in the rest of the ingredients until well blended. Serve with the marshmallows, if desired, and sip very slowly so you can thoroughly enjoy every last bit. Wow, that sounds great. Real hot chocolate always sounds so much better than the mixes! I’ve never tried raw milk. I am not a big dairy drinker right now – I think I overdid it for years and my body is revolting. :) I’d have to hunt down a local raw milk supplier and try it, and I’m not sure I’m there yet. That being said, I so appreciate your recipe and could see myself enjoying it with almond milk. And, love the info you gave about the chocolate. I only use unsweetened chocolate but there are so many different varieties and it’s interesting to learn what people think about each of them. Thanks so much for linking to Slightly Indulgent Tuesdays! !